Pigeons are virtually found to some extent in all urban areas around the world. It is estimated that there are 400 million pigeons worldwide and that the population is growing rapidly. Pigeons are highly dependent on humans to provide them with food and both roosting and nesting sites. Pigeons are monogamous and typically mate for life. In captivity, pigeons can live for around 15 years. However, in urban populations, pigeons seldom live more than 3 or 4 years. This is mainly due to natural mortality factors, such as predation by mammals and other birds, diseases, and stress due to lack of food and water. They require approximately 30g of food a day, roughly 10 % or their own body weight and 30ml of water. Breeding can occur all year, but mainly in the spring and autumn, a population of pigeons will usually consists of equal numbers of males and females, which look nearly identical, however, males are larger and have more iridescence on their neck. Pigeons will build a flimsy platform nest out of straw and sticks, with the male providing the nesting materials, the nest will be located undercover in an area such as a window ledge or beam. The male will also guard both the female and the nest! Female’s can reach sexual maturity as early as 7 months of age and 8 to 12 days after mating they will lay 1 – 3 white eggs but usually two, which hatch after 18 days. The young are fed pigeon milk, a liquid/solid substance secreted in the crop of the adult (both male and female) which is regurgitated. Chicks will fledge in around 25-32 days, further eggs are laid before the first clutch of young leave. 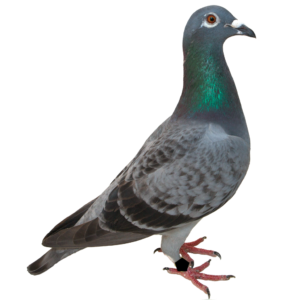 Risks and issues associated with pigeons. Psittacosis – this is a rare infectious disease caused by a bacterium called Chlamydia psittaci. It is mainly associated with parrots and other similar species but does affect other birds, including pigeons. Symptoms are commonly a flu-like illness and pneumonia usually appearing 5-19 days after exposure. Salmonella – this may also be present in some bird droppings. It is a bacterial infection that can cause significant diarrhoea.